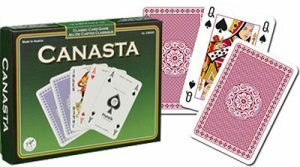 Canasta is a card game which was invented in the 1930s and remains popular for many players in both land-based and online casinos around the world. The game itself is rummy-like, but it does include some bold differences which set it apart from any other card-game variation. While it is fun and addictive, Canasta can be a tricky game to get your head around at first. To help you out, we have outlined the basic rules and how to play in this article. The word canasta is Spanish for basket and was created by a lawyer named Segunto Santos in Uruguay in 1939. Santos had a liking of the game bridge, but upon realising he had become addicted, switched to another card game, Rummy. After a while, Santos came to the realisation that Rummy was a game based too much on luck, so with the help of his friend, Alberto Serrato, the pair devised a new game and named it Canasta. The game was a big hit, spreading across Uruguay and into Argentina and even into the United States of America following World War II, peaking in the 1950s at which point it had grown to become the world’s most popular card game. The game is played using two decks, including Jokers, which play a special part in the game. The aim of Canasta is simple: beat your opponent by scoring more points. Points are accumulated by creating ‘melds’ and ‘canastas’. A meld is formed by combining at least three cards of the same type, for example three Jacks or five eights. Importantly, twos (deuces) and jokers can be used to form an initial meld or to increase its size. A canasta is a meld which contains seven or more cards of the same type, and can also include deuces and jokers. In a game of two, players are dealt 15 cards each. For three players, they each receive 13, while four or more players see each person dealt 11 cards. The game starts by each person drawing a card, with the highest denomination being the first to play. After the cards are dealt, one card is left face-up in the centre of the table, known as the discard pile, while the remaining cards are left face down in a stack known as the deck. The player must choose between drawing two cards from the top of the deck, or picking up the entire discard pile when it is their turn and adding it to their hand. However, players can only pick up the discard pile when the top card will assist in forming a meld. For example, if the top card is a five and you have two fives in your hand, you can pick up the discard pile to form a meld of fives, with the remaining cards added to your hand. Alternatively, if the top card was a nine and you had one nine and a deuce or a Joker, you could also pick up the discard pile and form a meld of three nines. The third and final way you are permitted to pick up the discard pile is if the top card can be used in addition to an existing meld or canasta on the table. Another pivotal feature of the game is the importance of a red three. If you draw a red three from the deck, the player will put the card on the table in front of them and draw another card to replace it. The red three will give you bonus points at the end of the game. After you either pick up the discard pile or draw two cards from the deck, your turn begins. Throughout your turn, you can form as many melds or canastas as possible, before ending your turn by placing one card from your hand on the discard pile. Your opponent will then have his/her turn, with the process repeating until the end of the game. However, when discarding there are two types of special discards which can effect gameplay. Firstly, a black three will block the discard pile when placed on top, preventing your opponent from picking it up until the black three is no longer on the top of the pile. The other types of special discards are the ‘wildcards’ – the deuces and jokers. If you discard a wildcard it is placed horizontally on the pile and ‘freezes’ the pile. The frozen pile is hard to pick up, with players required to possess two of the same card as what is on the top of the discard pile. For example, if the discard pile is frozen and several discards are made thereafter with a nine being the top card, only a player with two nines in their hand can unfreeze the pile and add it to their hand. Importantly, other wildcards are not permitted to be used as substitutes, with two real nines required to unfreeze the discard pile in the aforementioned scenario. The game continues back and forth until either the deck runs out of cards or until one of the players has formed at least two canastas and has discarded all of the cards in their hand.